Welcome my deliciously deviant dedicated disciples of debauchery to the Kreme Vault, a lavishly lascivious literary library of twisted tales. I am your host, the Kreme Keeper, and if you’ve found your way this far, kiddies, you might as well spiral helplessly out of control as your mind is melted, your body blown, and your intelligence incinerated. 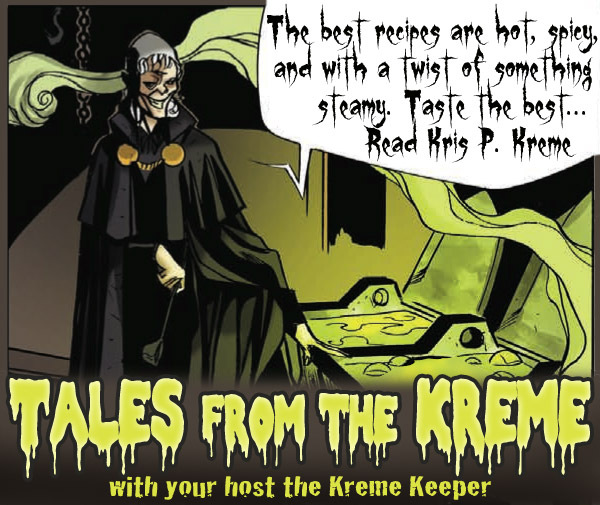 The tales from this special blend of Kreme will not take you into the expected erotica encountered everyday, but rather into the twisted turns of torrid tremblings, where the everyday becomes explosively orgasmic, short-circuiting all aspects of mental management into a scintillating climax of carnal cravings. The stories are sexual in nature, as are all things Kreme, so prepare the perverse portion of propensities propagating your every thought for tales that aren’t mere words strung together but are in fact roller coasters of ripe romps where anything can happen and anyone can end up simmering in the newest kauldron of kreme. Dare you taste of a mere drop of kreme, or should you leap lecherously long into lengthy tales, guaranteed to leave you mindlessly moaning for more? The taste is free, however as the keeper of the Kreme, it is my regretful responsibility to warn you that a taste is not enough and as the author once said, “feed your mind the kreme, and your thoughts will be glazed forever”.